Detroit News--Fueled by a surge in oil prices, Russia has turned into the hottest of the hot emerging markets -- countries where automakers that can supply the right models earn a lot of money, particularly in the early stages of the boom when demand is outstripping supply. In the past five years, auto sales have tripled. By 2010, many forecasters see Russia overtaking Germany to become Europe's No. 1 auto market with sales of more than 4 million vehicles. "There's no sign that this is going to slow down," said Carlos Ghosn, CEO of Renault SA and Nissan. The demand for oil and other raw materials that Russia holds in vast reserves is not likely to subside, he said. As crude prices have climbed to record levels, Russia's economy has taken off. Its gross domestic product has quadrupled since 2000. The country that once enforced economic equality now counts the second-largest number of billionaires. On the wide boulevards of Moscow and St. Petersburg, glittering Yves Saint Laurent and Gucci boutiques have replaced the drab Soviet stores with their bare shelves. While China and other emerging economies are evolving fast, the speed of the Russian transformation caught people by surprise. "The unique thing with Russia is that with the boom in commodities, the economy has strengthened very quickly. 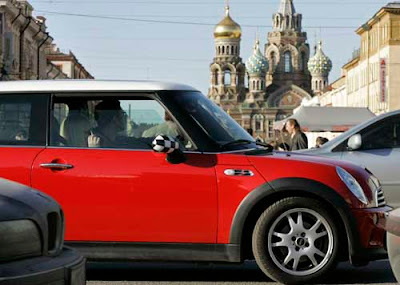 That's something we didn't foresee when we first started investing in Russia," said Lewis Booth, Ford of Europe chairman. For automakers like Ford, GM, Toyota and Nissan, which are struggling to boost sales in saturated home markets, emerging economies represent great opportunities at a challenging time. The Russian people would like to thank the Americans for the stimulus. Send more. Price target raised to $150 the Bernanie Bubble lives. Russia needs to work on its global warming propaganda it seems. Don't they KNOW cars are evil and will destroy the planet? But, I'm happy for the auto industry. Higher sales and profits mean more money in my 401K! It's the law of comparative advantage at work. Russia has abundant natural resources, so naturally they will be the lowest cost producer of many of them. Hey, wait a minute. Didn't I read somewhere that the US has abundant natural resources too? Oh, that's right. It's all protected somewhere in remote Alaska. WAIT A MINUTE! Alaska is RIGHT NEXT DOOR to Russia. Let's just install a big straw and take the oil. That problem of the misdirected stimulus can be fixed. It won't be so funny when we can manage to bring back $70 if not $50 oil, while leaving OPEC, speculators, and environmentalists out in the cold. Even better if it can be done by removing all of the legislation so that the US can drill oil and look for alternatives at the same time. That's why I'm still confident that GM won't be finished off or made into a "we don't make anything in the US, much less in Detroit" manufacturer. They at least make the vehicles that have the performance built-in. That, and you don't have to spend $70000 to get a well-performing V6 from them. I see where you're going(sarcasm, perhaps) with this one. Are you aware of slant drilling, and the use of it?